Whew!I finished it. All 826 pages of Little Dorrit by Charles Dickens. I didn't give up even when I wanted to. Why? Because this was a book club selection and I've bee terrible at quitting book club books lately. I used to be so good at finishing all the book club books but somewhere along the way I fell off the wagon. I'm happy to say I conquered Little Dorrit. So what is Little Dorrit about? 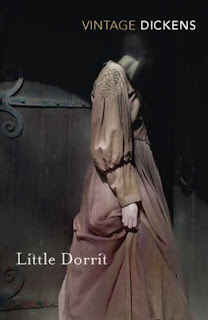 Little Dorrit is actually Amy Dorrit the youngest daughter of a debtor imprisoned in the Marshalsea. She was born there and has known no other life. Her father, however, is a proud man who thinks himself better than he is. Amy sneaks away to work as a seamstress in order to feed her family. When the son of the woman she works for returns from China, he gets involved in Amy's life and changes it in surprising ways. The reason I nearly gave up on Little Dorrit is because I could easily put it down and forget about it. Not much happens for much of the book that you can't see a mile away. In fact, the last 100 pages or so are the most exciting. Then there is a "Soylent Green is people!" moment and back to the predictable. It really felt as if Dickens was phoning it in. There are the standard numerous characters: the humble heroine, the damaged hero, the badies, the goodies and the harpies. The rich and poor get entangled in each others' lives and by the end we see how it all plays out. But I wasn't all that interested. It was all a bit dull. What I came away with was that jerks are jerks whether they are rich or poor. Le yawn. I guess you could say that this was not my favorite Dickens. I would recommend Bleak House over this one. Bought this one from Bookcloseouts.